Boyds Coffeeis so consistently delicious because of the details. Our Roastmasters meticulously evaluate each day's roast for aroma, flavor, body and acidity - guaranteeing superb quality from Origin to Cup . Every batch of coffee is tested multiple times to meet our rigorous standards, ensuring each cup of Boyds Coffee is the ultimate coffee experience. 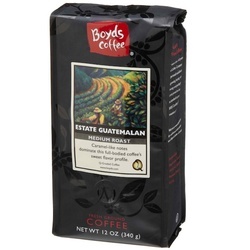 At Boyd Coffee Company we select much of our coffee from Rainforest Alliance Certified farms to ensure that the coffee is grown to sustainable standards that protect the environment and the rights and welfare of workers, their families and their communities. We also believe coffee education makes a difference. As growers learn new ways to manage their crops, increase their sustainable farming practices, and test for quality through the Coffee Quality Institute's programs, everyone benefits. With these quality standards, growers produce a higher quality of coffee and receive a better price, all of which is a sustainable way to improve people's lives.